On the plane the next day, my stomach and mind grumbled and struggled to digest what had happened. My head ached and an overwhelmingly dank sense of disappointment seemed to permeate all things. This had been my first visit to Tuscany. I’ve travelled around almost every other region of Italy’s blushing, fecund allotment, but never before to the Cypress-lined, rolling hills of Tuscany. I was excited, I was to eat and drink great things, I was hopeful. To keep things short, the trip had been great; Tuscany is, of course, as undulatingly wonderful as in all the pictures, but the all-important meal was a disaster. There was promise in the setting: a small, family-run trattoria in suitably bucolic surrounds. A short, hand-written menu, a modest wine list featuring local bottles, what could be finer? We choose the bistecca alla Fiorentina, that most noble and high-toned of all Tuscan dishes. We order Chianti from an unknown producer on recommendation from the house and look forward to what vinous wonderment lay ahead of us. 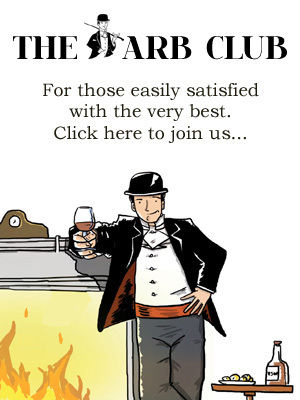 It is disastrous…the house are clearly helping out a struggling friend by offering his sub-standard plonk to unsuspecting patrons – it’s barely drinkable, tough and tannic and lacking in any sense of charm. The steak should have been a joy, but instead it is an arduous chore. The meat is inexplicably totally raw in one corner and burnt to a well-done crisp in another; it’s as if someone’s gone wild with a blow torch, but only in the corners of the steak that upset him. Foolishly we struggle on through, with the steak, the wine…then the flaccid semifreddos and toxic coffee. The Fernet Branca that we finish on is the smoothest note…and that’s saying something. The bill is as torturous as you might have guessed. We leave, almost in tears; meals like this make me search for some kind of sweet oblivion. So back to London, and up to Primrose Hill. Fresh off the plane and still feeling somewhat dejected. It seems fitting to visit this sickeningly picturesque corner of London, our own Tuscany, if you will, on returning from those rolling hills. I’ve decided to come to another Italian restaurant to attempt to bury all memories of my misdemeanors in Tuscany. Negozio Classica seems like a good option, I’ve never been to the newer, Primrose Hill outpost, but I know the Notting Hill branch of old and remember eating truffles and drinking lovely wines, so I figure this must be a good way to subvert the terrible resentment I’m feeling toward the owners of the restaurant that will never be named. Negozio Classica sits about halfway up that elegant curve of buildings that leads up toward the park. The restaurant opened in 2011, as a second London outpost after the aforementioned West London restaurant. Interestingly, Negozio Classica is wholly owned by Avignonesi, a Tuscan wine estate – a stone’s throw from the place of raw bistecca. As you might imagine, the wine list is highly impressive, if narrowly focused on Italy, and Tuscany in particular. The restaurant, which also sells wines to take away, operates a reasonable policy of charging retail prices plus a modest corkage charge for those who want to drink these wines in the restaurant. 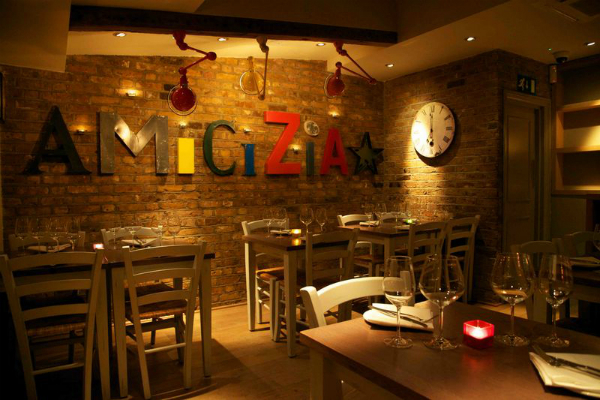 The restaurant is brighter and more obviously design-focused that its Notting Hill sibling. Primary colours and Anglepoise lights frame the room. We sit in the sunlit upstairs dining room and allow the charming manageress to make some suggestions. She tells us of a recent trip to Tuscany to visit Avignonesi…I try not to visibly bristle. 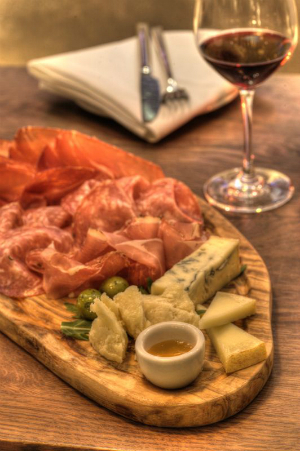 We start with olives and a selection of excellent breads and antipasti. This involves fat-flecked slices of salami and fragrant finocchione,a San Daniele ham and deep shades of bresaola. This feels good – calming and simple, the quality of the products shines through and starts to re-build my damaged faith. Aubergine slices come lightly grilled and drizzled with rich, spicy olive oil. Once again, simplicity is king, making for a soothing, gentle dish. You may call me a masochist, but the only way to cleanse my mind of memories of last night’s meat is to order beef once more. Here the tagliata is served in thick slices on top of spicy wild rocket and aged parmesan. The beef is very good, with a crisp char on the outside, deep pink within – perfectly cooked and a world away from the supposedly noble, but ultimately inedible charms of last night’s prime Chianina. We’re served young Vino Nobile de Montepulciano Riserva from Avignonesi’s own vineyards. The wine is silky where last night’s was coarse. Smooth tannins replace ragged ones and a pleasing sense of balance is restored. A tiramisu finishes the meal in classic style; this one is heavy on cream and offers indulgent, soporific promise, promise that’s edged along by a lusciously sweet, intense glass of Vin Santo. We stumble off into the North London night, heavy of stomach, satisfied and happy, our faith in the finest of cuisines restored at the hands of a North London wine bar. A lesson therein perhaps – not always is it neccessary to search for authenticity in a haystack, sometimes it’s hiding round the corner, daring you to look in. 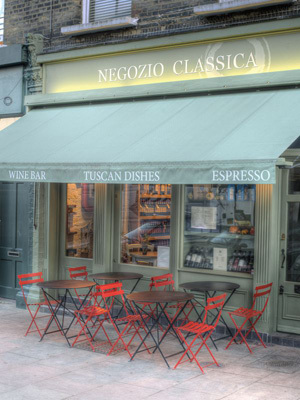 Negozio Classica, 154 Regent’s Park Road, London NW1 2XN. Tel: 020 7483 4492. Website.